Taxes are an unfortunate part of life. While they do have their purpose in helping our governments, schools, and states run well, it’s difficult not to feel slighted when so much of your paycheck is taken from you. You might initially think that if you earned more money, you wouldn’t feel the sting of taxes quite so much. However, as you probably know, the higher your income, the higher your tax bracket goes as well. Even then, while you’ll never be able to get out of paying taxes entirely, there are ways to lower your taxes, so that you can take home more of your hard-earned money. Through an array of strategies and deductions, consider utilizing these eight tips to lower your tax liability. While you should probably allot money towards your retirement savings anyway, if you’re hoping to save on your taxes, you might want to contribute even more to this fund than you already do. Traditional 401(k)s and IRAs allow you to make contributions towards your retirement pre-tax. Which ultimately means that if you want to contribute $10,000 to your account, you can do so before your paycheck is ever taxed. Although you will be taxed upon withdrawal of your retirement account, chances are that your tax bracket will actually be lower during retirement, which means you’ll still save. If you’ve been toying around with the idea of donating to charity, or already do, you might want to start or add some additional charities to your list. Anytime you make a charitable donation, before December 31st, you’ll lower your tax liability for the year. Simply hang on to a receipt from said donation, and you’ll be able to deduct that amount come tax season. Don’t forget about non-monetary donations. If at any point, you’ve donated a large amount of goods or clothing to certain charities, be sure to get an estimate of that as well. Health care unfortunately doesn’t come cheap, and many opt for higher deductibles at the cost of lowering their monthly payments. However, that high deductible can come at a high price to you too. This is why many choose to contribute to an HSA (Health Savings Account) or FSA (Flexible Spending Account) to help assist them with medical expenses. More than helping you in a bind, however, the money that goes into those accounts does so pre-tax and is withdrawable sans tax as well. Ergo, by choosing to contribute to your FSA or HSA, you’re also lowering your taxable income. When a stock or particular investment is doing well, it can be tempting to sell. Although you shouldn’t base selling your stock entirely on tax reasons, it’s worth consideration. Carefully examine and consider whether or not holding on to well-performing stock for a little longer could put you at a lower tax rate. If it makes sense and there are no other underlying factors forcing you to sell, it might be the direction for you to go. Moreover, by waiting until after January 1st, you’ll save yourself from having to report those gains on this year’s current income. Chances are that you aren’t fully aware of all the deductions available to you. School supplies, self-employment costs, alimony payments, charitable donations, or even certain medical expenses, just to name a few, usually qualify as tax deductions. Moreover, there’s a myriad of other deductions that might be available solely to your situation. Wherever you’re able to deduct, do your best to take advantage of everything available to you. It could save you more than you know. While it never feels good to lose on your investments, there are ways to utilize them to your advantage. If you’ve experienced any losses, be sure to cut your losses before the end of the year, and use that amount to offset anything you gained. It’ll save you from having to pay as much as you might have on your investments that did well. On another note, if your losses exceeded your gains, you can also use that as a way to deduct upward of $3,000 from your usual taxable income. Your children no doubt bring you joy, they can also bring you incredible tax breaks as well. For starters, you’ll receive a Child Tax Credit of over $1,000 for every dependent child you have under the age of 17. Moreover, as your child is likely set to go to a university someday, you’ll be able to receive deductions for that too. Throughout their childhood, you can opt for deductions for any income that goes into an educational savings account, and then, once they’ve reached that age, receive deductions for tuition expenses as well. Filing your taxes is no easy process, especially as your finances get more complicated. At the end of the day, if you truly want to know how to lower your tax liability, it might be worth it to ask a professional. Tax accountants know the ins and outs of taxes. They are usually aware of all the exemptions, deductions, and various loopholes you can use to help reduce your liability. So, if you truly want to know all the ways you can lower your tax liability, consider splurging a little for the advice of a pro. Taxes are one part of being an adult that most everyone dreads. More often than not, it can feel like all your hard-earned money, and then some, goes straight to the IRS. Of course, the lower your tax bracket, the less taxes you pay. However, lowering your tax liability is easier said than done. Nonetheless, by taking full advantage of all the opportunities to you, you can help reduce your liability. That way you can save your money for other, important financial goals. 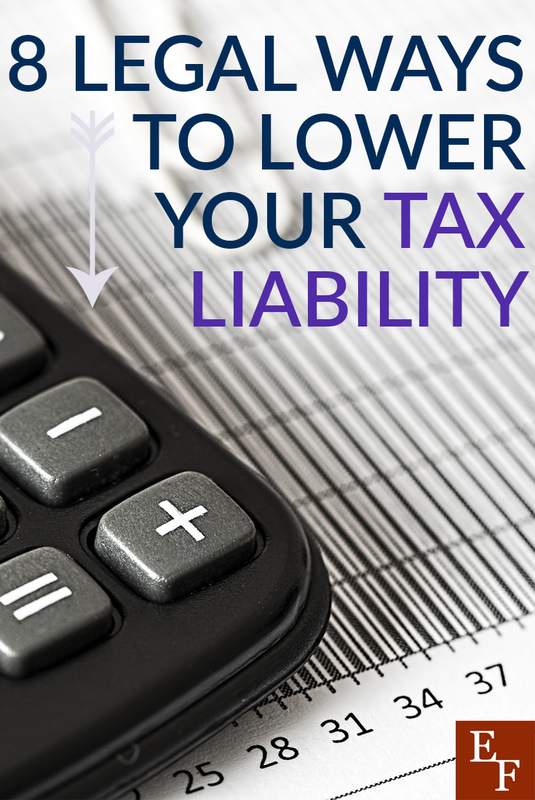 How do you lower your tax liability? Have you done any of these things to save on taxes?